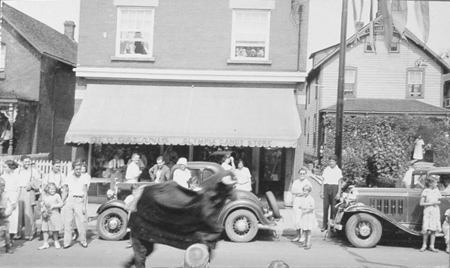 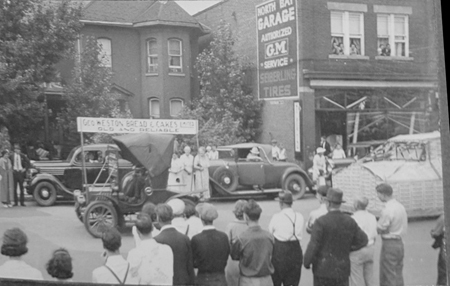 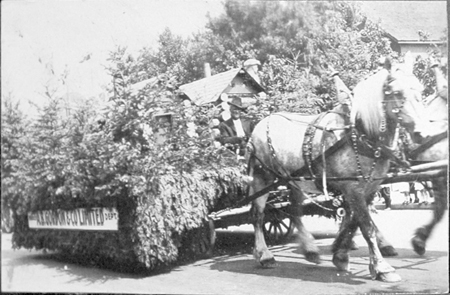 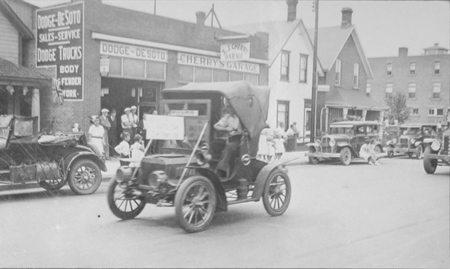 In 1925 the grand opening parade of OHW on Monday August 3rd was billed as a pageant parade. 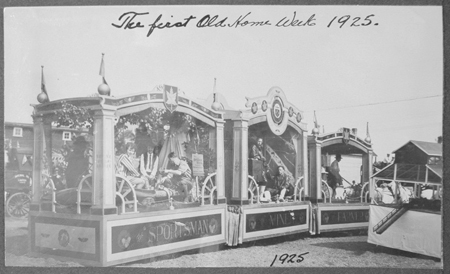 At the time, pageants were all the rage. 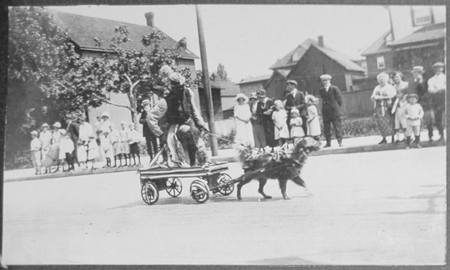 Quebec City had put on a huge pageant to celebrate its 300th anniversary in 1908. 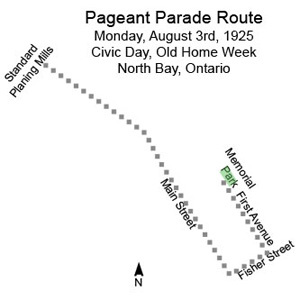 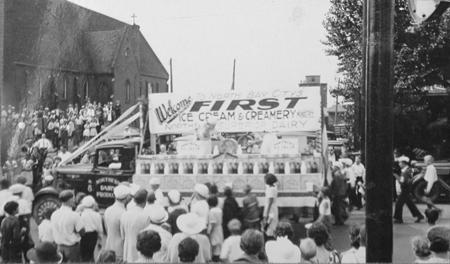 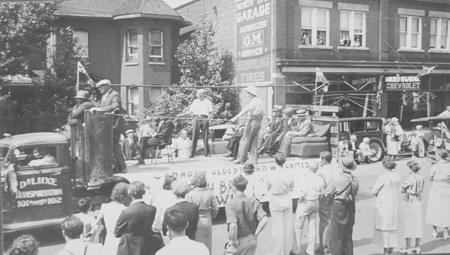 In Ontario, many of the Old Home Week celebrations of the 1920s included a pageant but these required a large outdoor space to stage them and hundreds of volunteers to act in them and North Bay settled for a less ambitious pageant parade instead. 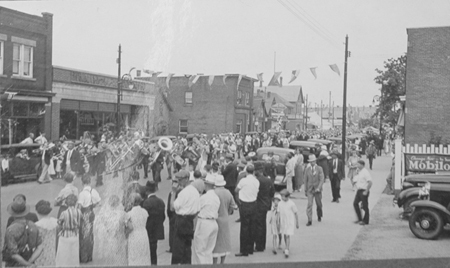 Still, like pageants, this would allow the town to highlight its history as well as its recent progress for the visitors. 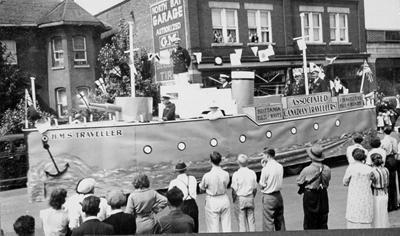 The key pageant floats were designed by an “expert” and the costumes were also specially prepared for them. 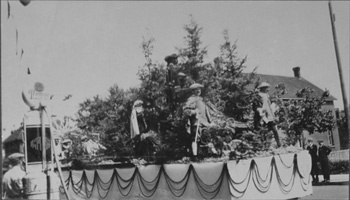 Samuel de Champlain Pageant Float 1925. 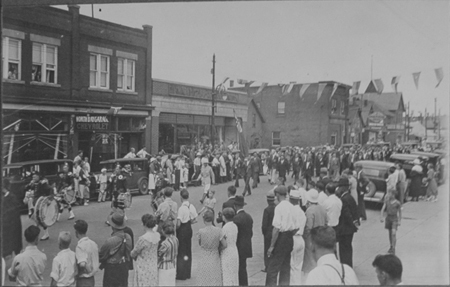 Photo by Hartley Trussler. 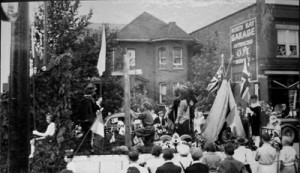 Other pageants floats represented Jean Nicolet, the first white man to set foot in North Bay, Father Claude Pijart, the first priest to the Nipissing Indians, a band of coureurs de bois and fur traders, and the Rev. 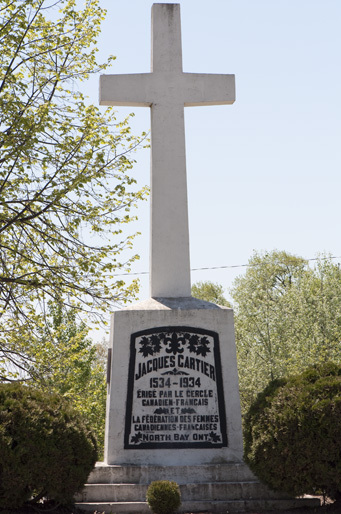 Father Le Caron and a band of frenchmen. 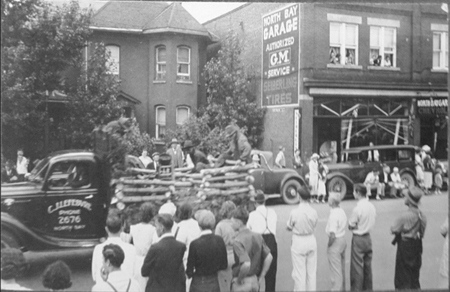 The three railways present in North Bay, put considerable effort into their floats as well. 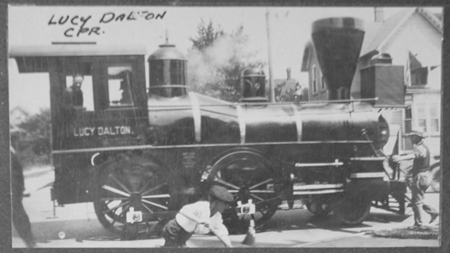 The Lucy Dalton. 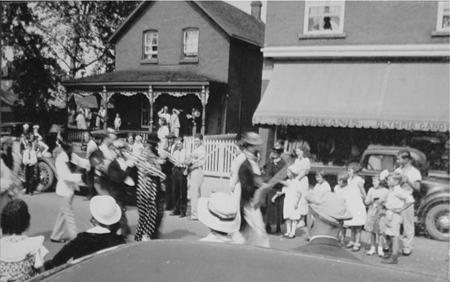 Photo by Hartley Trussler. T & N O Float. 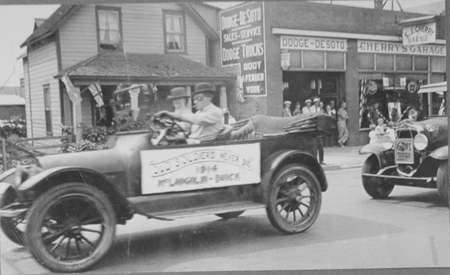 Photo by Harley Trussler. 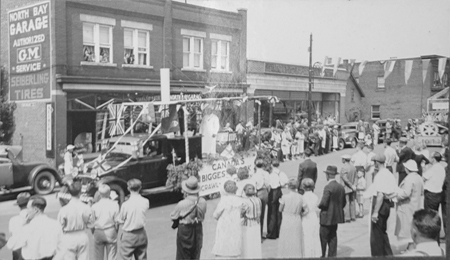 The parade included clowns, bands, soldiers, policemen and many floats by North Bay businesses. 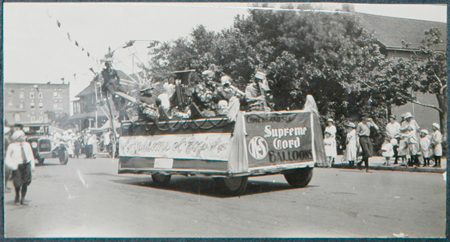 Few of them were described but pictures of the parade show some of them. 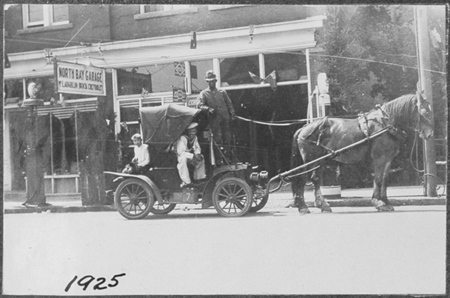 Below: A.B. 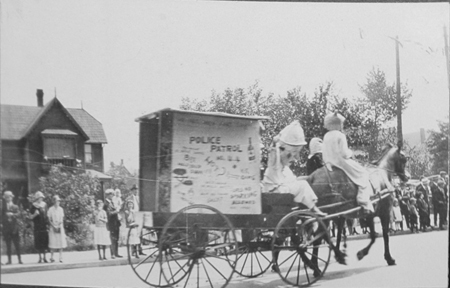 Gordon & Co. Ltd., a major lumber company in the area, the float from Beamish Stores and a float showing a model of the original post office. 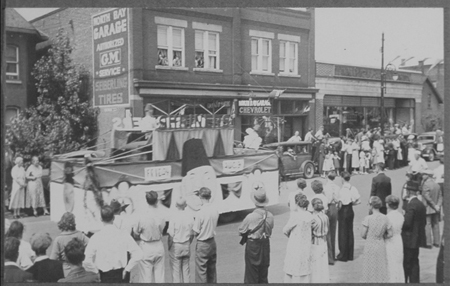 The pageant parade formed at the west end of Main Street. 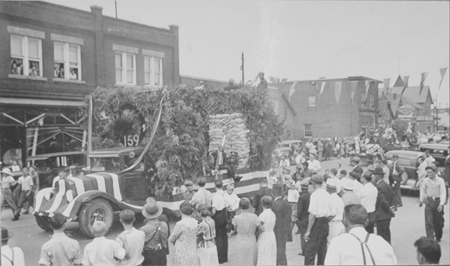 Getting it going took some time as the parade streched for six city blocks and the marshals had to place each one. It marched down Main to Fisher before turning North and making its way to Memorial Park where a large crowd was waiting and the city of North Bay was granted its charter. 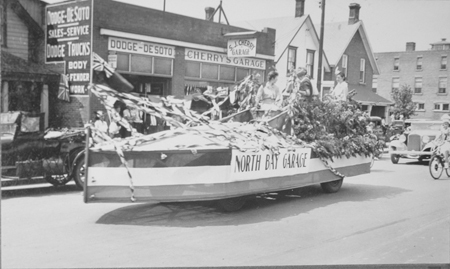 Hartley Trussler was working that day but he had his camera with him and took time to take pictures of several floats as they went by the North Bay Garage. 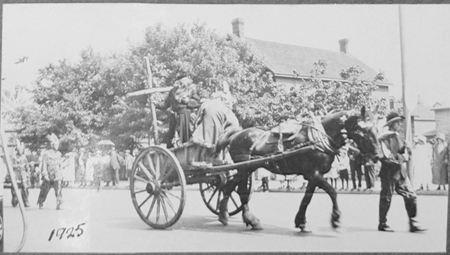 For more photos from Trussler’s album see below. 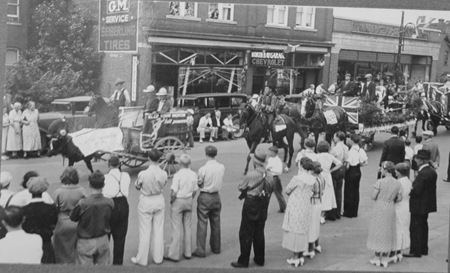 This entry was posted in Celebrations, Community History, Images and tagged Hartley Trussler, North Bay, Old Home Week, photographs on January 27, 2013 by Françoise Noël.